An elder was asked by a certain soldier if God would forgive a sinner. 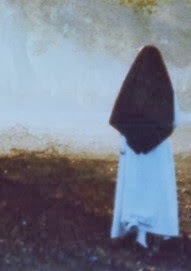 And he said to him: Tell me, beloved, if your cloak is torn, will you throw it away? The soldier replied and said: No. I will mend it and put it back on. We all know and are convinced that God has no need of human beings. Yet because of his merciful love, God created us out of nothingness so that we may share in his happiness, not only in this life, but for all eternity. And because we are the work of God’s masterpiece after his own image and likeness, we can always be sure of his love and mercy to sustain us. What does it mean to bear the image of our Creator? It means to become like him in every way, so that our joy may be complete. If you are wondering what God is like and how you can become like him and be happy, make sure you spend some time meditating on all of today’s Mass readings where God himself gives us very clear images and instructions. Jesus further instructs his disciples (that means all of us who wish to become children of God) to go an extra mile on this path of holiness and strive for perfection! We are the children of our heavenly Father, are we not? Should we not be like him in whose image we were created? God’s instructions for these extraordinary acts of mercy and love are difficult but they are not impossible to fulfill. As we press toward the goal of perfection, let us remember that God gives us his Spirit to dwell in us, making us temple of the Living God. (Second reading) God also gives us all the graces and examples needed to help us to become perfect just as our heavenly Father is perfect. Not that we are perfect or have already obtained this perfection, as St. Paul says, but we press on to make it own own, because Christ Jesus has made us his own. (Phil. 3:12) And whenever we find that God’s command of perfect love is impossible to achieve, all we have to do is look at the Cross of Jesus to learn this lesson of love and to find courage and strength to do so. by his command of perfect love. and bring your salvation to the ends of the earth. Sharing with you a wonderful little article about our monastery featured at the Dominicana blog! The article was written by one of our Dominican Friars, Brother Thomas Davenport, O.P. of the St. Joseph Province of the Order of Preachers. It’s amazing what a bit of greenery can hide. Most people, if asked where the most expensive office space in the country was, would have a hard time believing it was outside of New York City. They’d have an even harder time believing it when they were actually in Menlo Park, CA, looking at the nondescript two story suburban office complexes set back from Sand Hill Road by a beautiful, but not particularly notable, array of unmanicured trees and shrubs. Someone could soak in the flora every day on the way to work completely oblivious to the fact that they were passing by the most powerful collection of venture capital firms in the world. I know. I did. On the other side of Menlo Park is another sleepy little street, one that most people simply use as an outlet to escape gridlock on the way to and from work. The most memorable breaks in the residential flow of Oak Grove Avenue come from the beautiful little Church of the Nativity and its school set on opposite sides of a plain white wall enclosing a Catholic retreat center. Someone could pass by every day and be oblivious to the presence of the oldest monastery of Dominican Nuns on the West Coast behind a thin row of trees on the other side of the road. I know. I did. 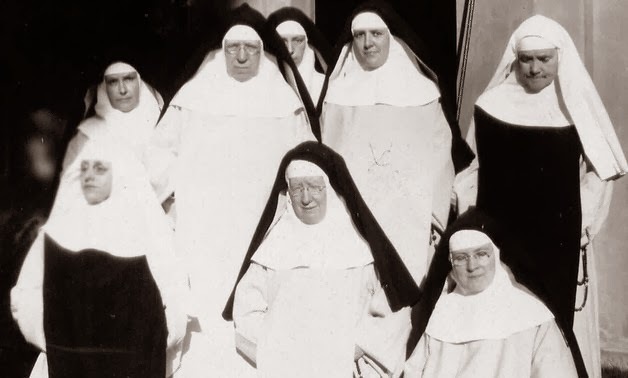 In the heart of Silicon Valley, the land of rapid innovation and sleepless nights perfecting the next big idea, the nuns of Corpus Christi Monastery keep a vigil of prayer and adoration rooted in 800 years of tradition. 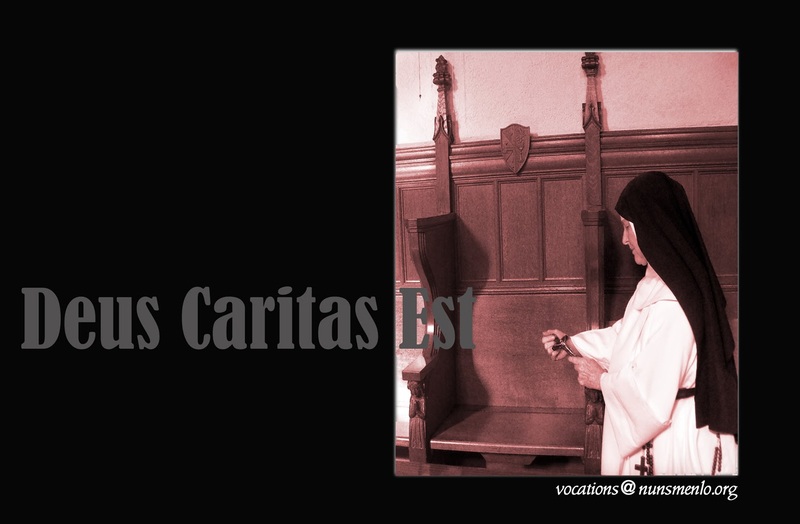 This particular instantiation began in 1928 when eight Dominican nuns took up residence in their newly constructed Gothic monastery, based on the design of their previous home in the Bronx. Of course, the roots of their community stretch back much further than New York. 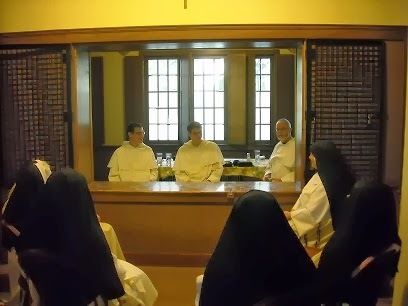 Almost fifty years previous, four nuns had arrived in New Jersey from Oullins, France, to establish the first American Dominican monastery. From Oullins they brought not only the tradition of cloistered Dominican life dating back to the efforts of St. Dominic himself in Prouille, but also the more recently granted special privilege of perpetual adoration of the Blessed Sacrament. 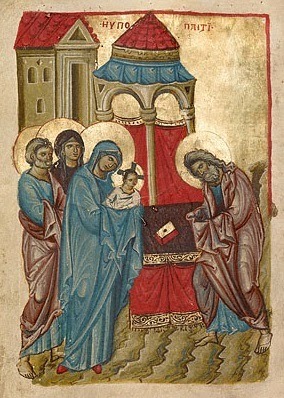 This privilege was extended not simply to their first American home, but to all its foundations as well, and this life of prayer and devotion to the Eucharist was a primary inspiration for the Dominican Friars of the Province of the Holy Name and the Archbishop of San Francisco to try to bring a group of cloistered nuns to the city. It took decades of work, including living their first seven years on the West Coast in the home of a San Francisco benefactor, and in the end housing ordinances led them to settle 30 miles south of the city amongst the majestic century-old oak trees of Menlo Park. They brought with them expertise in the embroidery of vestments, the illumination of parchments, and the baking of altar breads, but the heart of their life was and is community and prayer, most especially a love and devotion for Our Lord in the Blessed Sacrament. Over the years, this hidden life of prayer and adoration has drawn to it a diverse community of sisters of many nationalities, reflecting the diverse cultural heritage of the San Francisco Bay area and beyond. They continue to live out their particular part of the mission of the Order of Preachers by their lives of prayer, contemplation, community, and study. Further they foster a greater love of Our Lord by their example and prayer, inviting whoever might venture behind the thin row of trees through the open doors of their chapel to join them for a moment of adoration before the monstrance. While countless aspiring entrepreneurs hope to make their fortune by getting a few precious minutes to make their pitch in the unassuming-looking office buildings on Sand Hill Road, across town on Oak Grove Avenue anyone can join the the Dominican nuns of Corpus Christi Monastery for a chance to speak their piece to, or simply be in the presence of, the one true source of our salvation. I know. I did. The Dayspring from on high has visited us and given light to those who lived in darkness. 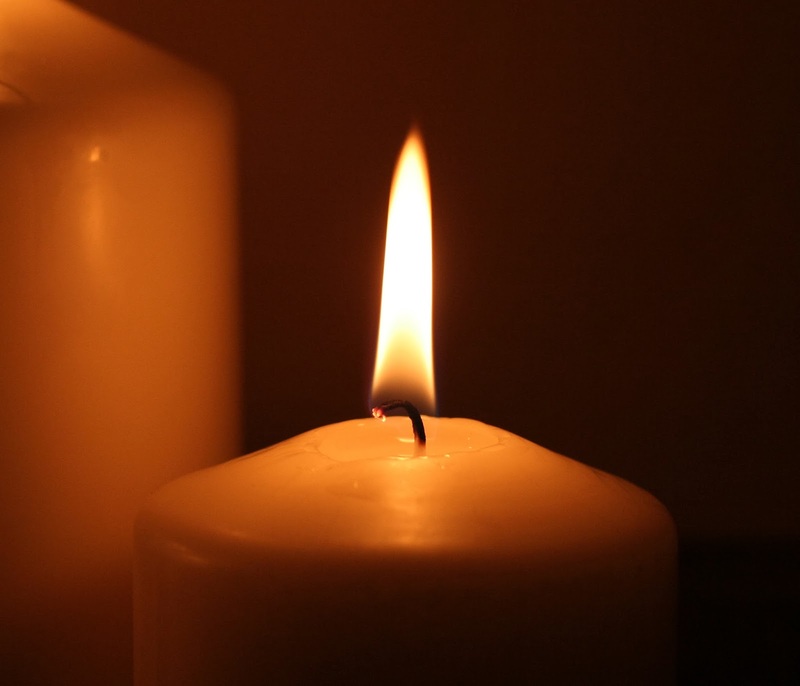 This, then, is our feast, and we join in procession with lighted candles to reveal the light that has shone upon us and the glory that is yet to come to us through him. So let us hasten all together to meet our God. Let us rejoice, for today we are reminded again that God is present among us. He who is our light, our life and our hope has come into his holy temple to set his people free. Our Mother Church also dedicated this day as a World Day for Consecrated Life. Let us give thanks to God for the gift of consecrated persons for the whole Church. As we give thanks to God for their selfless service to our Mother Church, we also entrust all consecrated persons to the heart of Mary, our Mother, that she may obtain for them the fullness of her Son’s divine light. Let us pray also that God may inspire many young peoples whom he calls to priesthood and consecrated life to follow him courageously and unreservedly. The God both three and one.